What is the right replacement dose? The right dose for steroid replacement is one which is adequate to prevent an Addisonian crisis at any time, but not too much to cause subclinical Cushing’s. Historically we have used too much of either drug, because when glucocorticoids were introduced, the risks of subclinical Cushing’s were not recognised, and it was clear that insufficient treatment resulted in rapid death from Addisonian crisis. Many people wrongly believe that it is safer to give a small excess of steroid daily to prevent this, but we are now seeing the cumulative effect of a small excess of steroids resulting in an increased long term risk of cardiovascular disease and osteoporosis after many years of a small excess of steroid. Growth rates in patients with congenital adrenal hyperplasia give us some insight into longitudinal glucocorticoid replacement. Once daily prednisolone improved growth rates compared to three times daily hydrocortisone. 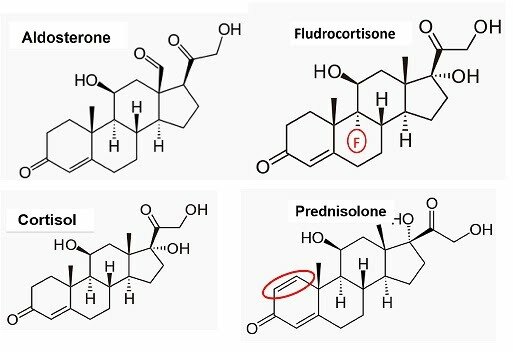 The relative potency of prednisolone to hydrocortisone was between 6:1 and 8:1, being additional evidence for prednisolone 3mg daily being equivalent to hydrocortisone 20mg (10mg in the morning, 5mg at noon and 5mg in the afternoon). We have found that 3-4mg prednisolone once daily is equivalent to a normal replacement dose. 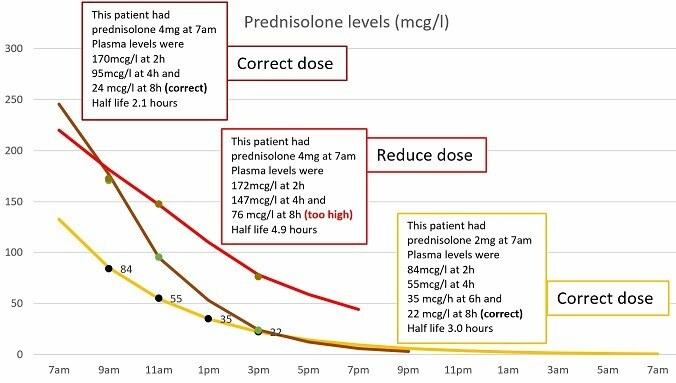 Longitudinal data is required to inform our decisions, but until such data exists, prednisolone should be used first line replacement in view of its convenience and cost. We have been using prednisolone 4mg as the primary treatment for all patients at Charing Cross who were hypopituitary with the addition of Fludrocortisone 100mcg daily in all hypoadrenal patients since 2014. The doses of both drugs is titrated according to response (blood pressure and potassium for fludrocortisone and 8h levels as explained below for prednisolone). Prednisolone has a longer half-life than hydrocortisone, and can thus be safely given once daily. There is some variance in prednisolone metabolism, so the correct dose is between 2mg and 4mg once daily. Our starting dose is 4mg daily, and a prednisolone level can be measured at 8h. If the 8h level is between 15mcg/l and 25mcg/l, then replacement is appropriate. An example of this is given in the figure below, where 2mg is administered at 7am, and a level at 3pm is 22mcg/l (yellow). Terminal half-lives vary. If the terminal half-life is towards the lower end, a higher prednisolone dose than usual (>3mg) may be required. If the half-life is towards the higher end, a lower than usual dose (<3mg) may be required. All three patients below felt very well but one is on too much prednisolone (red) as evidenced by the 8h level. If you need to measure prednisolone levels, these can be done by LC-MS/MS at Imperial College Healthcare NHS Trust. Contact Emma Walker for details. Prednisolone or Hydrocortisone for replacement therapy? There has never been an evidence base for the use of hydrocortisone or any other steroid for replacement in patients with adrenal insufficiency and there is no data demonstrating superiority of hydrocortisone over prednisolone. We need a randomised trial to determine which is more appropriate. An excess of glucocorticoid might increase BMI, glucose, HbA1c or blood pressure. Undertreatment puts patient at risk of an Addisonian crisis. Current evidence suggests no difference between prednisolone and hydrocortisone. http://www.endocrineconnections.com/content/6/8/766.full.pdf. Natural hormones have a short half-life. Specific enzymes have evolved for the rapid metabolism of endogenous hormones so that concentrations can be rapidly altered by changes in the secretory rate. Native hormones such as cortisol and aldosterone thus have a short half-life. Analogues with longer half-lives make therapeutics practical. For aldosterone we use fludrocortisone, an analogue with a fluorine atom that significantly lengthens its half-life permitting once daily administration. Similarly the half-life of cortisol can be increased by inserting a double bond between positions 1 and 2, giving prednisolone. What about the different binding of prednisolone for the glucocorticoid (GC) receptor? Whether the difference in avidity of prednisolone for the GC receptor is an advantage or a disadvantage is not known. It is possible that the increased avidity will reduce the risk of an Addisonian crisis in a patient who has taken prednisolone as a normal replacement dose but then is unlucky enough to get an infection such as norovirus. In such a situation the increased binding and the slower dissociation of already absorbed prednisolone may help prevent a crisis whereas oral hydrocortisone may not last long enough if one gets norovirus and hence oral hydrocortisone may not be safe. Anyone who develops a gastrointestinal infection such as norovirus needs to URGENTLY seek medical attention and have an injection (intravenous, intramuscular or subcutaneous) of 100mg hydrocortisone (not a tablets of any sort). In a hypotensive emergency, a few excessive doses are very important, but on a daily basis, the lowest safe exposure to glucocorticoids should be used.